I'm rather dismayed that the reaction of a couple of people to this story has been "Oooh, scary! I wouldn't want to go there!" - not at all the desired effect, and my hosts at Tourism Northern Territory will be disappointed if that's the general feeling. One of the main reasons I enjoy going to Australia is that their wildlife is so much more interesting than ours, which mainly amounts to a bunch of birds - that's interesting as in bizarre, and also as in dangerous. Snakes, crocodiles, spiders, scorpions, box jellyfish, cone shells, sharks... it really adds a frisson to a trip outside the cities (and occasionally inside them too). But although I've walked, ridden, camped and kayaked through the Outback, and slept under the stars more than once (so, twice) I've never been troubled by so much as a mosquito. 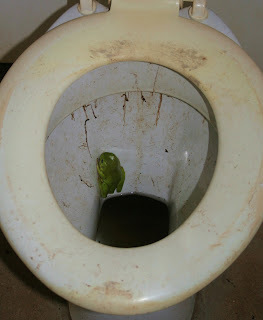 No snakes sharing my swag, no scorpions in my boots, no spiders down my neck - the worst I've had is a frog in the loo, and to be honest, the state of the loo itself was the scariest part of that experience. My most frequent encounters with unpleasant Australian wildlife have been courtesy of their white-tailed spiders which are now established here in Auckland, and of which we have a sizeable population in our house. They apparently have a nasty bite which some claim can cause necrotising fasciitis, they're smallish hunting spiders and they like to lurk inside clothing dropped on the floor (still not a horrifying enough prospect to persuade my older daughter to use hangers) - I did once find one on my bra when I was getting UNdressed. The one in the photo? A golden orb female - huge but harmless (unless you're the tiny golden orb male and she notices you mating with her). Just another story to tell after a lively but entirely survivable trip to Oz. Nice photos. My 3 y/o saw the frog and wants to know "why is nobody peeing on it? Maybe it's too dirty."